White blood cells, preferentially granulocytes, are radiolabeled using In-111 oxine or Tc-99m HMPAO to localize sites of infection and inflammation. If the patient has an infection suspected to be non-suppurative or lymphocyte-mediated, infection suspected to be chronic, or is neutropenic, Gallium scan is preferred. 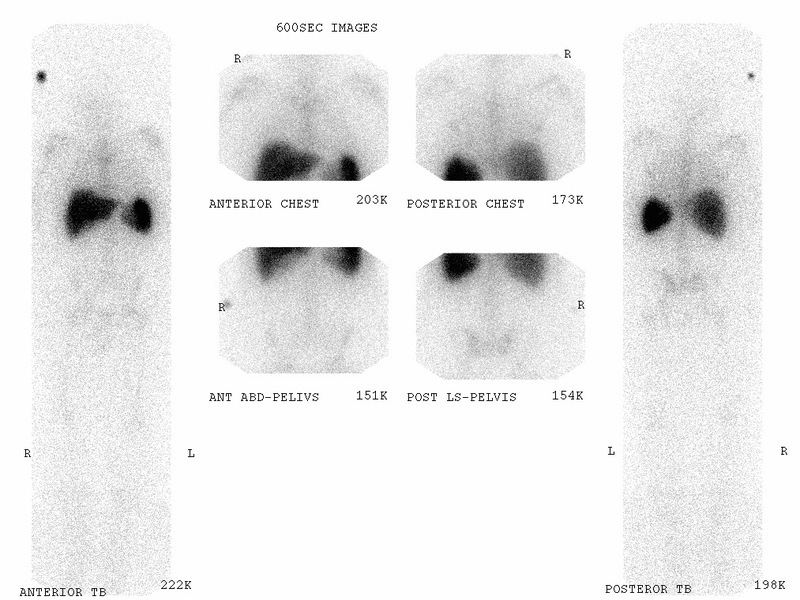 The Tc-99m HMPAO WBC scan is favored in the pediatric patient. Because WBCs accumulate in reticuloendothelial cells, by 18-24 hours post-injection radiolabeled WBC activity is physiologically present in the spleen, liver and bone marrow, with milder activity in the major blood vessels as seen in the image above. Also physiological is mild diffuse pulmonary activity at 4 hours. If the radiotracer is In-111 radiolabeled WBCs, no activity should be seen in the bowel or GU system (e.g., kidneys, bladder). If the radiotracer is Tc-99m HMPAO radiolabeled WBCs however, free Tc-99m pertechnetate activity can be seen in the bowel and GU system.